One of the best things that happened after having Miss A was being able to spend long, uninterrupted Saturday mornings watching Saturday Kitchen because I was "busy breastfeeding the baby, and it's takes far longer than bottlefeeding, don't you know". And yet, until recently, I'd never once tried one of his recipes. A few months ago, I bought a copy of James Martin's Masterclass for a fiver and then promptly lost it when the husband decided to go on a tidying jag. 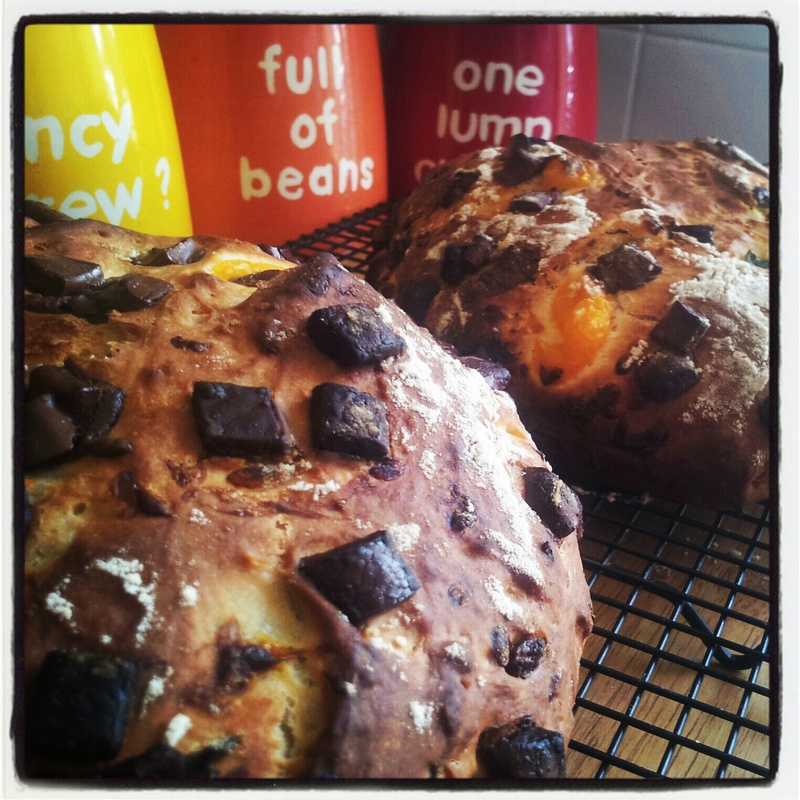 Rediscovering it the other morning when I was pottering around the spare room on the daily work conference call (I was working from home and have to go in the spare room because I have a noisy lovebird next to my desk), a quick idle flick through turned up the recipe for Chocolate, Satsuma and Mint bread which seemed a great idea as I had leftover mint from making Lorraine Pascale's Minted Lamb Burgers earlier this week. The book itself professes on the front cover to "Make Your Home Cooking Easier". 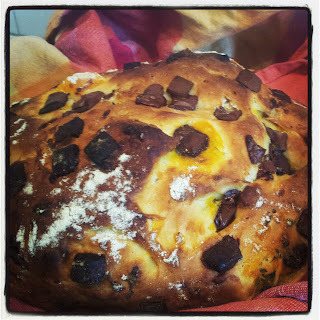 This recipe may have been easy, but it had me on tenterhooks for a while. It starts out with a basic bread dough, although only uses 200ml of water to 500g of flour which made a very dense and unyielding dough. Having fully subscribed to Lorraine Pascale's mantra of 'the wetter, the better' (although you do have to have a limit! ), this seemed entirely the wrong thing to do. He even comments in his basic white bread recipe that 'where most people go wrong is in not making the mixture wet enough and so the finished bread ends up too doughy and dry'. Curious. Anyhow, scepticism over my very doughy dough aside, it doubled in size as predicted within the hour. And then came the near disaster. 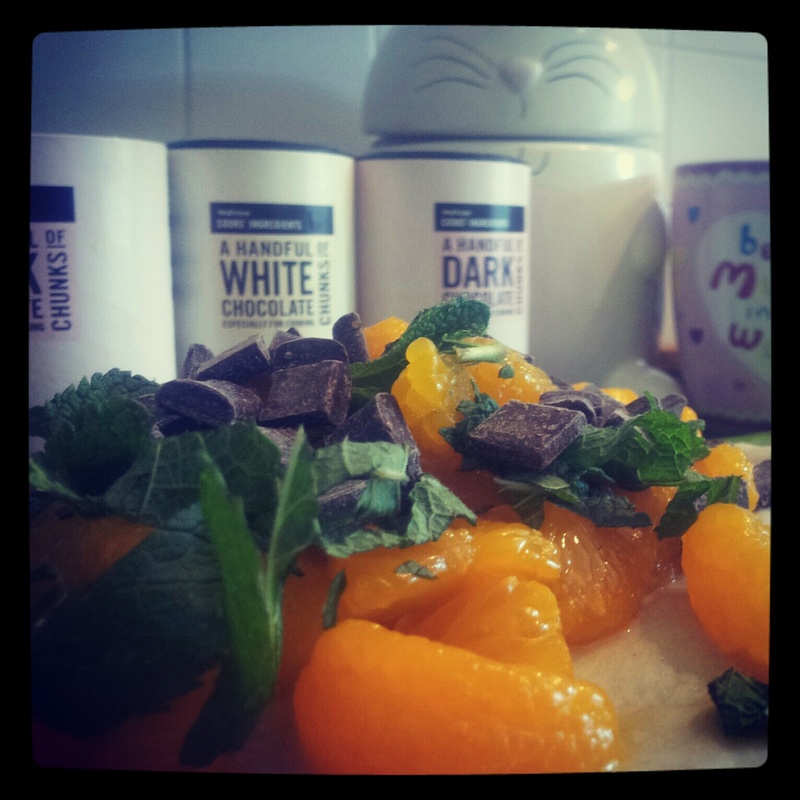 The recipe states "carefully mix the chocolate chips, mint leaves and satsumas in by hand". All well and good. Except it does nothing to prepare you for the slimy mess that ensues when you try to work tinned satsumas into such heavy dough. 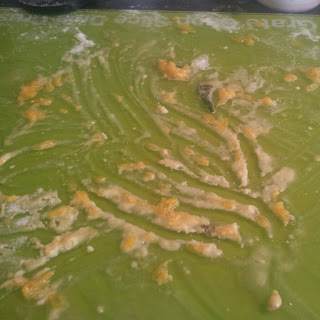 Although it does explain why he used less liquid in the dough because suddenly, my work surface was swimming in juice. I'd left my oranges to drain in a sieve for about ten minutes, but in my mind, they weren't quite dry enough. If I was making this again, I'd definitely pop them onto some kitchen paper to remove some of the additional moisture. I'd also try and have the sense to work the dry ingredients thoroughly into the dough first and then prod the satsuma bits in later. 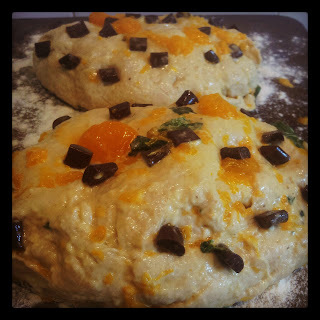 As it was, my dough ripped with each attempt to ensnare the chocolate and orange and juice was leaking everywhere. At one point, I was fully prepared to just sling it all in the bin and write it off as a waste of ingredients, but it seemed a shame to waste all the chocolate chips. I finally managed to get them onto the tray, vaguely shaped and floured. They rose beautifully for the second rise, were baked and came out actually looking like the ones in the book. I was disappointed that the lighting in my kitchen was so poor again today as the photos don't do them justice. Of course, Miss A who is addicted to home made bread (see sconegate) absolutely loved it. So did I. The husband took a bite and screwed up his face. "I don't like that" he said. "Why?" "Well I don't like it. You don't like red wine but you don't give a reason why." "Erm, because it gives me a stinking hangover and I don't like the tannins in most reds. Plus you NEVER share so I don't get the chance to ever form a proper opinion" He couldn't come up with a suitable reason for not liking the bread until I revealed it had mint in it. "Ah, that's it" says he. It didn't stop him from eating the whole slice, nor did it later stop him from polishing off a quarter of the loaf before tea because he'd missed lunch. So it's obviously not that bad. Just nicely different. 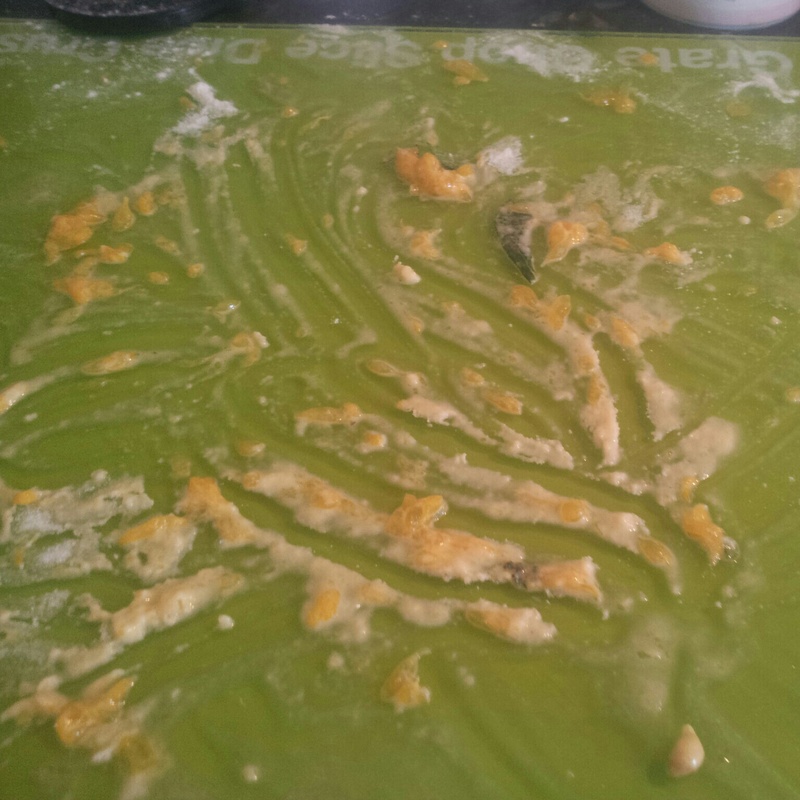 In fact, I really enjoyed the orange and mint combination. If you get a mouthful with both flavours at the same time, it's really refreshing and zingy and works well with the bitterness of the dark chocolate. I will definitely be making this again next time I have some spare mint. And I like that it makes two loaves so one can (hopefully) go in the freezer. And, for the first time in months, I've managed to use a baking recipe from somewhere other than Short and Sweet and actually enjoy it. I need to do more of this! Sift the flour and salt into a large bowl, then add the sugar, butter and yeast. Pour in the water, a little at a time and begin to mix by hand until you have a dough that is sticky but pliable. Try not to make the dough too stiff as this will result in a hard loaf of bread once cooked. Add a little more warm water, if needed, to ensure that the dough remains pliable. Place the dough on a lightly floured work surface and knead for ten minutes, then mould into a ball and place in the bowl. Cover with a clean, damp tea towel and set aside to rest somewhere warm for 1 hour or until it has risen and doubled in size. Knock the dough back lightly and tip it out on to a floured work surface. Knead in the chocolate and mint leaves until evenly distributed. Carefully work in the satsuma pieces. Divide the dough into two equal portions. Shape into a rugby ball shape and flatten slightly. Place the loaves on a floured baking sheet with the folds in the dough underneath. Sprinkle with flour, then score the top with a sharp knife and place somewhere warm for another hour to double in size again. Meanwhile, preheat the oven to 220c/200c fan/ Gas 7. Bake the loaves in the oven for 25 minutes. They are cooked when the base of each loaf sounds hollow when you tap it. Remove from the oven and place on a wire rack to cool. *I would just like to add, that they have to be reasonably good looking too. I can't stand Jonny Vegas. Looks like you are enjoying making bread. I didn't think these will materialise from your earlier tweets.